Two Wairarapa College teenagers who saw their beloved grandmother taken by Alzheimer’s disease are hitting the road to honour her, and help others, who are affected by the degenerative brain disease. 15 year old Georgia and 13 year old Millie Higinbottom’s Nana Marg passed away last July, nine years after she was first diagnosed with Alzheimer’s disease. Many Alzheimer’s sufferers are trapped in a world of confusion and disorientation. Alzheimer’s is an irreversible, progressive brain disease that slowly destroys the thinking and memory skills. The girls remember their Nana being extremely giving and generous in her life; a very caring, selfless person, always involved in community events. Alzheimer’s slowly robbed her of her memory, to the point where she didn’t even recognise her own reflection, let alone her beautiful grandchildren. They saw all the pain their Poppa and family went through and want to prevent others from going through the same thing. “We really want to give back and honour our Nana Marg’s life by raising money to donate to the charity ‘Alzheimer’s New Zealand’ in the hope that a cure can be found for this horrible brain disease”. Growing up on a farm, both Georgia and Millie have been sporty all their lives. To help them in their cause, they have invited 20 friends and family to join them in a relay that they have suitably named ‘jog your memory’. 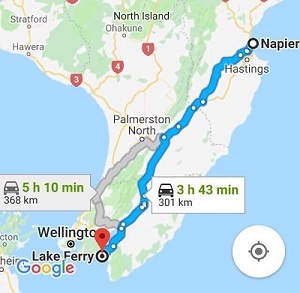 It will start in Napier and finish three days later at Lake Ferry, from April 14th-16th. As a group they will run 100km per day for 3 days. Each runner will cover over half a marathon per day and will run 75km all up. Leading up to the event, the runners will train on the flat with a goal to run 5 kilometres in 25 minutes in a daily training regime. The route they have chosen for the relay allows them to stay with friends and family to keep costs to a minimum, and ensure every cent that is made can go purely to research. The first night they will be staying with their Aunt, the second night at the moment is on a woolshed floor in Weber and the third night they will be driven to their family home in Tinui after their day’s run. The runners involved are seeking support from local businesses with donations or products which will be auctioned off at Quiz night in Tinui. ‘Shear Xpertise’ have kindly gifted them the use of their vans for 3 days. They will be holding mufti days at local schools and organising raffle draws. Millie and Georgia would like to thank you for your support, your gift will make a difference to the lives of people living with Alzheimer’s. Research leads to better diagnoses, improved treatment, better management, the identification of risk factors and hopefully, eventually, a cure!